It's now almost four years since Panasonic first introduced us to the mirrorless interchangeable lens camera, in the shape of the Micro Four Thirds Lumix DMC-G1. Since then, all of the other major manufacturers have entered the fray, in the process offering cameras in a variety of shapes and sizes - from diminutive beginner-friendly models such as the Olympus PEN E-PM1, to unashamedly high-end models like the Sony NEX-7 and Fujifilm X-Pro1. Nikon, meanwhile, has ploughed its own individual furrow with its family-friendly 1 J1 and 1 V1 models. This simply reflects the fact that different cameras are targeted to different kinds of users - be they serious enthusiasts looking for a small, highly capable camera, or compact-camera upgraders looking for SLR-like image quality in a smaller, easier-to-use package. Canon is the last big player to show its hand, and its initial entrant - the EOS M - is unashamedly targeted to the latter group of users. To all intents and purposes it's a mirrorless version of the recently-announced EOS 650D, but with a simpler interface that's designed to be more approachable for novice users, and obviously much more compact in size. It's based around a new 'EF-M' lens mount, and two matched lenses will be available at launch: the EF-M 18-55mm f/3.5-5.6 IS STM zoom, and the EF-M 22mm f/2 STM 'pancake' prime. But it's still very much part of the EOS system, and all of the company's existing EF and EF-S SLR lenses can be used via the co-announced 'Mount adapter EF-EOS M'. 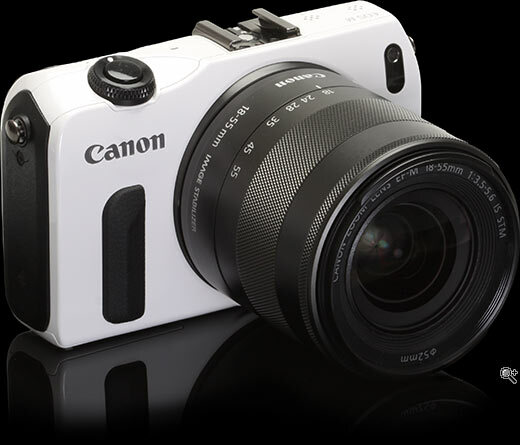 The EOS M features a compact, magnesium-alloy body, and will be available in four colours - black, white, silver and red. It has no built-in flash, but instead a hot shoe on the top plate, and in many markets (although not the US) it will come bundled with the new AAA-powered Speedlite 90EX unit. There's neither a built-in viewfinder, nor connector for an external unit - composition is solely using the camera's rear screen (which is fixed, rather than articulated). The EOS M will be available in four colours - silver, red, black or white - although they may not all be sold in all markets. The EOS M's commitment to simplicity is reflected by its physical control layout, with buttons and dials kept to a minimum. 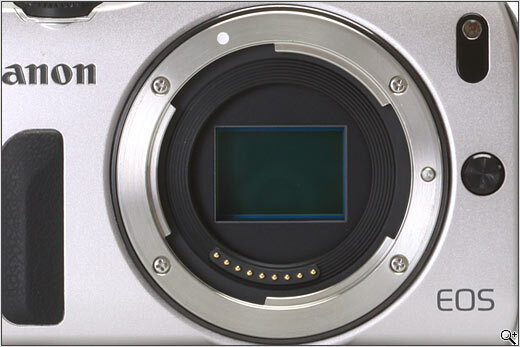 The exposure mode dial - a staple of Canon's EOS range for over 20 years - has been reduced to just three positions, distinctly reminiscent of the company's Ixus / Elph compacts. The rear of the camera is also rather compact-esque, with a familiar combined 4-way controller / settings dial and just a smattering of buttons. The lack of physical controls is, however, substantially made up for by the large capacitative touchscreen on the back. This uses much the same interface that Canon introduced on the EOS 650D, and stands out as the most usable, comprehensive and engaging touchscreen that we've yet seen on an interchangeable-lens camera. But whereas on the 650D its use is very much optional, on the EOS M it becomes the preferred method of interaction with the camera. Because mirrorless cameras have struggled to make headway in the US, Canon is only going to sell one kit option in this market. Targeting an enthusiast buyer, the camera plus 22mm pancake will be available from speciality photo stores only for $799, with the 18-55mm zoom sold separately for $299. The company will also be emphasizing its video capabilities, which are essentially the same as the EOS 650D but in a smaller, cheaper package. Movies can be recorded in Full HD 1920x1080 resolution at 30, 25 or 24 fps with stereo sound, using the highly-compatible MOV format and H.264 compression, with a time limit of 29 min 59 sec per clip. The EOS M offers a choice of either fully automatic exposure in video mode, or as much manual control as the user wishes to take. The 3-10x electronic zoom first seen on the EOS 600D, but mysteriously missing from the EOS 650D, is also available - with minimal loss of quality at the 3x setting. A new mirrorless system needs a new lens mount, which Canon has called EF-M to emphasis its continued compatibility with the company's existing EF mount for autofocus SLRs. It's a fully-electronic bayonet mount, with 9 contacts between the lens and camera. Unusually, the white dot for aligning the lens is at the 11 0'clock position on the mount. The EF-M mount is 58mm in diameter, with a flange distance of 18mm from the bayonet to the sensor. As the image above clearly shows it's matched specifically to the APS-C sensor size. So don't expect a future full frame EF-M mount camera - it's not going to happen. Like all other mirrorless cameras, the EOS M's shutter is open by default even when the camera is turned off, exposing the sensor. This may seem disconcerting to SLR owners, but we've never experienced any problem with this approach. Like Canon's live view-capable SLRs the EOS M uses an electronic first curtain to activate the exposure, and the physical shutter is only used to end it. This helps reduces shutter lag and keep shutter noise down - meaning the EOS M is one of the quieter models of its type. The EOS M is released with two new lenses for the EF-M mount - an 18-55mm image-stabilized standard zoom and a compact, 'pancake' prime. Both feature Canon's 'STM' stepper motor for autofocus, which allows near-silent refocusing during video recording. This means electronically-coupled 'focus-by-wire' manual focus; thankfully though Canon hasn't been tempted to discard physical focus rings. However there are no switches to set the focus or IS mode - these are controlled from the camera. The lenses use minimalistically-styled, plain cylindrical barrels that bear more than a passing resemblance to Sony's NEX series optics. In terms of dimensions they're fairly typical for their class, which means they're smaller than corresponding SLR lenses; the zoom is near-identical in size to the Sony E 18-55mm F3.5-5.6 OSS, whereas the pancake is very similarly-sized to Panasonic's Lumix G 20mm F1.7 ASPH. As the only cameras we've seen so far are pre-production, it's premature to say much about focus speed. But while on first impressions the 18-55mm focuses pretty quickly, the 22mm is distinctly slower. This is not totally surprising given that the entire optical unit racks back and forth for focusing; this is not a design approach that's ever been associated with ultra-fast focusing on this type of lens. But we'll wait for production cameras and lenses to make a proper judgement. 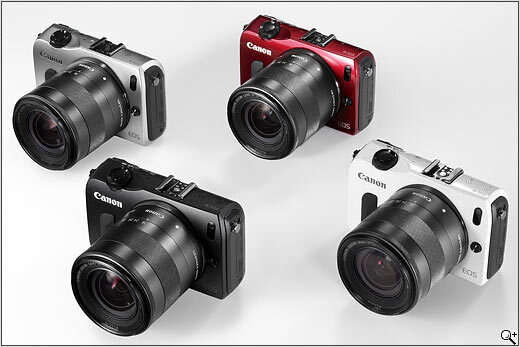 The EOS M is a small camera - indeed one of the smallest APS-C models around. Here we compare it to the EOS 650D and Panasonic Lumix DMC-GF3. Here's the EOS M with the 22mm f/2 next to the camera with which it share its innards - the EOS 650D with EF 40mm f/2 STM lens. As you can see, eliminating the reflex mirror and optical viewfinder has enabled a dramatic reduction in size. Here's the EOS M side-by-side with the Panasonic Lumix GF3 - a model that's similarly-aimed at compact camera upgraders, and one of the smallest mirrorless cameras around (it's since been replaced by the similar-size GF5). Both cameras use a touchscreen to complement their limited array of physical controls, but the GF5 has a built-in flash rather than a hot shoe. It also uses the slightly smaller Four Thirds sensor. My wife has one of these. She prefers using it over her 40D as it is lighter, smaller and fits into her handbag. A great little camera providing its limitations are recognised. DSLR image quality, compatible with all my EOS lenses, tiny, and very light! I bought one as back-up body for an EOS 1-Ds ii. It sure beats carrying two 1-series bodies. what the best viewfinder for this camera? i already found EVF-DC1 but it too expensive. can you recommend some? I bought this and missed the 30 minutes video limitation. This has burned me a couple times already. Could have stuck with my G9. I have been using my Eos M for about 6 months now, picking it up on sale for $350 with the kit 18-55. I quickly added in the Eos M EF mount adapter, picked it up off Ebay for $50, then a 70-300 4-5.6 and the 50 1.8. This is my MAIN camera at the moment and it's amazing, I have been using cell-phone cameras for the past many many years but the Eos M is so compact and has been a nice entry into the world of SLR's. After 6 months of us I'm feeling limited by it's lack of view finder and slow focus speeds; even with update. Magic Latern helps enhance features but has been buggy with continuous shooting. Action shots are do able in manual, maybe not good for low light sports. I bought one, in a bundle, which included the 22mm lens, EF Adaptor, Flashgun and then bought a second one with the 18-55mm lens at a stupidly low give away price. This little camera is BRILLIANT! No, you cannot use it for action shots, but for general tourist photography, it gives you wonderful sharp pictures, which make me grin ear to ear, when the finished image appears on my Lightroom 5. With the 22mm lens, it makes for a wonderfully small combination, to slip into my bicycle saddle bag for when I am out on one of my weekend rides. Ignore the negative reviews and get one while you still can. Oh, and if you can get one at a reasonable price, DO buy the 11-22mm lens as it is a phenomenal bit of glass! I picked up an EOS-M for $225 used in like new condition off of Amazon. It had the 22mm lens and came with an extra canon battery. The pictures it takes are wonderful but I got it primarily video. With Magic Lantern you can shoot in crop mode which eliminates moire. You can even shoot video in RAW with ML. Purchased two types of adapters and can use all of my current canon glass including FD's. Sluggish auto focus, no viewfinder, poor battery life plague this camera for sure but if it is a solid second B camera, for video or for when you need to be discreet. IMHO you really can't beat it for the price. What a bizarre offering this turned out to be. I was really holding out hope for something with even a modicum of inspiration behind it. And then they have the temerity to ridiculously overprice the damnable thing. Dear me. I know it wont happen, yet I'll try once again: An in depth review? The EOS-M is a great sensor in a tiny package with a functional but not great control system. That being said the positives of this camera totally outweigh any negatives. -super cheap- try finding a better sensor at double the price. -super compact. With the 22 mm pancake, it is a super stealthy, fast setup that takes great pictures in many situations. -I bought a $15 adapter that allows the use of any of the incredible and cheap manual FD lenses that are out there. With a 50mm 1.4, it is a compact and excellent video camera that can handle the darkest rooms you can imagine. I prefer manual focus for most video anyway. -The kit 18-55mm lens is sharp and well built and very small. -autofocus is slow and imprecise compared to any other Canon DSLR. -lack of viewfinder make it difficult to compose shots in bright lights. I just bought an original Canon 5d which will be a great supplement to the M. With the two cameras, I can do anything! 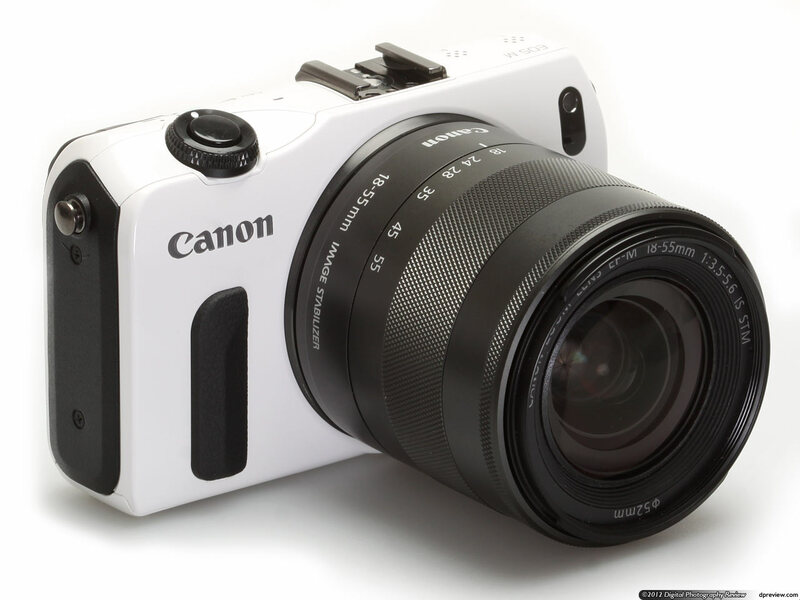 how is canon eos m ? good or not good ? if you can live with the "slowish" Af (which is not that slow really)it is a great camera!Takes wonderfull pictures. There is a typo - the EF 40/2.8 is claimed to be 40/2. OK - I know this is an old review for a much disliked camera (almost always by people who have never tried one) - just reviewing images taken at a wedding during the week with an EOS-M and an Olympus pen 5 - NO CONTEST - the CANON images just POP with colour and life - yes the Pen has fast AF (much faster) but the final images from the little M are brilliant. Come on Canon get serious and support the M series as you know you should. PS - met with a guy from Panasonic earlier today about the GH4 (most interesting) - he quoted that Canon have over 20 % and are increasing market share - Pan have 17 % and Nikon also have 17 % of the total DSLR/Mirrorless market at the £700 price point (UK) trouble ahead for Nikon me thinks…. It has only 2 lens in US market. The stellar UWA and telephoto zooms can be readily ordered from Canada, Tamron has an 18-200 superzoom that's in stock in the US, and there are a number of Samyang-sourced mirrorless manual lenses with the EF-M mount. Even if you discount the use of adapters, which works just as well as it does for Sony's system, there are plenty of optics available- and if you count even just the EF-EF-M adapter, the camera can be used with the best lens lineup on the market. Admittedly, the EOS-M isn't a great first camera, nor is it a great only camera, when compared to more filled-out systems, but it does take very nice pictures and the available lenses are very sharp; and if one already has Canon gear, it's a no-brainer sidekick/backup at it's current price. Let's look at these numbers, Panasonic has 17% market share of whole system camera market, on par with Nikon and canon? That's totally impossible. And canon with at least 40-50% market share of dslr, only managed get 20% of total share? That means mirrorless has same share with dslr, even in Japan it is struggling to get half the market, let alone Europe, the most consertive market in world.
" met with a guy from Panasonic earlier today about the GH4 "
Is this a good for a beginner who want's to try exposure photography? I wish to take the lens off the camera and attach the adapter supplied for attaching the lenses of the SLR. I do not wish to attach one of these lenses but to use a T-ring to attach the camera to a telescope. The camera has obvious advantages for this purpose. It is compact and relatively light and the shutter can be released by the wireless release. There is no mirror and so no mirror slap. The screen is a decent size for manual focussing. The model is supposed to afford a fully manual exposure mode. But can anyone tell me whether the Canon EOS-M will actually work without one of its own dedicated lenses? I like very much EOS-M after firmware update. IQ is very good, AF speed is not the best, but like many bulky DSLR. They have very promised project. Are you certain about 3-10x digital zoom? I had chance to play with the one with latest firmware, and couldn't find that feature. An excellent camera once the latest firmware is downloaded which gives an entirely acceptable auto focus speed which was previously too slow. This camera seems to be victim of the one issue Canon baiters, most of whom just repeat the received image from its initial reviews. The image quality is excellent, and the ability to use the full range of Canon lenses on a compact body is wonderful if you have a collection of lenses. The build quality is very good and exceeds my Canon 700 dslr handsomely.We have even used it for astro photography where it is also good, its native prime lens being excellent. The camera was bought for my wife who likes dslr image quality but not the size, encumbrence and anoraklike image that goes with them. All in all, a well made camera that is excellent for all normal purposes and has a great appeal for Canon lens owners. I would reccomend it any day. How can you say the image quality is excellent when the competitors blow it out of the water. Even an smaller M4/3 sensor has more dynamic range and similar high iso capability these days. The native prime is indeed good but that's the only thing it has. That is why you can find them on sale everywhere. The price collapsed with a reason. It can't keep up with the competition. Can a $400 camera take as good a picture as a $4000 pro shooter? There seems to be an error on the part of DP Review or mine in regard to the touch control for focus and shutter. Here's what DP Review says: "There are four touch buttons at the corners of the screen, allowing you to change exposure mode, call-up the onscreen Q menu, enable/disable touch focus and touch shutter, and magnify the display." The segment that says "enable/disable touch focus and touch shutter" might be inaccurate. The button does, in fact, turn the touch shutter off and on, but I don't think there is any way to disable touch focus. I would love to be wrong, as I really want to be able to put the camera on center-point focus (like any other DSLR) and not worry about it shifting on me when I accidentally touch the screen in the wrong place. I love the touch focus as a feature, but not as a mandatory feature. I've always used center-point focus and want that option. I don't think it exists on the EOS-M. It definitely should disable touch focus as well. My best guess as to what you are experiencing is you probably (hopefully) have your camera set to continuous focus. If you disable that in the second tab of the shooting menu (with the red cameras), it should work as you want. I haven't been able to recreate what you are describing in any other way, so I hope that will work for you. Is there EVER going to be a full review? There are some potentially VERY attractive close-out bundle deals, but I'm reluctant to purchase without a full review from DPReview. And my speculation is there may be some terrific bargains near Thanksgiving for Black Friday. But I really don't want to be as ignorant as I am now when considering such a bundle purchase. Image quality is like every other 18mp Canon Dslr. Poor high ISO for an Apsc and poor dynamic range. However it's comparable with the 16mp M4/3 sensors. The AF of the Canon however is not. It's the worst performer in this for some years. even with the firmware update. Combine that with limited native lenses and no interest of Canon to change that and you have 1 very poor option. In the mirrorless market there are 3 great options. M4/3 for formfactor and lot's of amazing lenses. Fuji X-mount for Retro styling and stunning image quality. Sony NEX-mount for great image quality with manual lenses becouse of the good Apsc sensors(Nikon D7000 sensor) and focus peaking. The Fujis do have better image quality although not dramatically so. If they were $300 there would be no contest. As for the EOS M. the focusing is slow and it has no viewfinder or option to add one. The image quality is fine and the price is right. Dynamic range is typical of Canon; less than Fuji but enough for millions of people, every day. Noise is also typical Canon; not as good as some others but not a problem unless you use ridiculously high ISOs that are a bad idea in the first place. If you grew up with film, where "pushing" to ASA 800 was possible but with a big loss of quality, the fact that the EOS M is noisy at 12,000 ISO won't be of much concern. Something is going on because it's now available on-line, or in stores for around 50% of the original price. If it performs the same as the EOS650 (identical to the 750), it's now a real bargain. Guess what? I now have a camera with 2 lenses both of which are not only incompatible with my 58mm filters but also with each other!!! 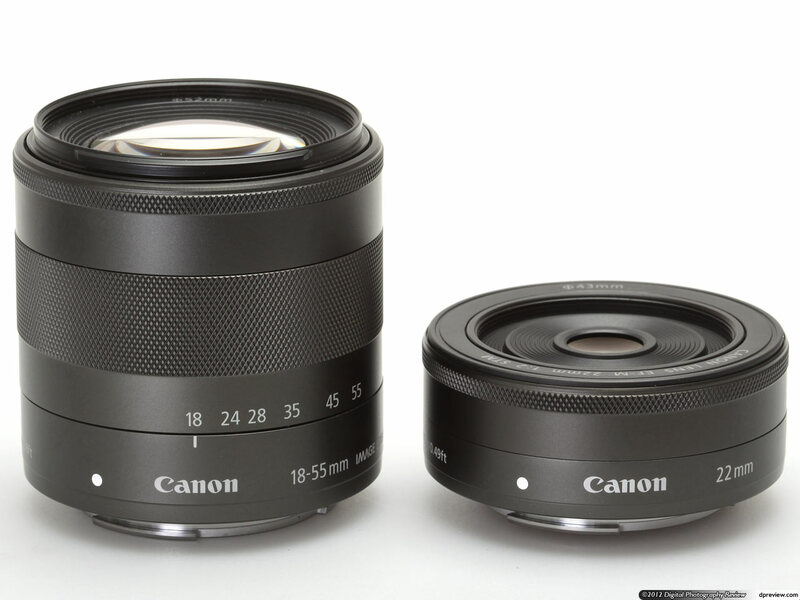 The zoom thread is 52mm, and the other 22mm lens has a 43mm thread despite being the same size barrel!! Who designed this? Canon, do you think I like lugging around tons of camera kit when I travel? Please spare a thought for us traveling photographers and try to make everything properly compatible with the DSLRs (including a decent battery) on your next attempt. Great images, but what is this camera supposed to be and why is this not the G16 replacement I paid for? built in electronic viewfinder will enhance the battery life. 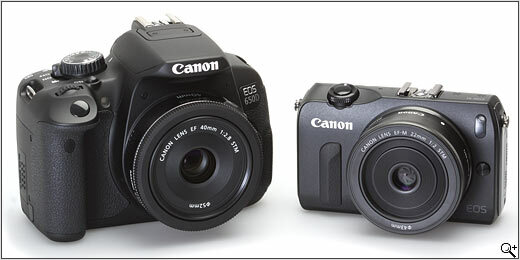 My 6th Canon camera and the EOS-M is a big disappointment. Images are good but the user interface is terrible. Handling is poor. Hard to hold without accidentally resetting something OR blocking the autofocus beam which is stupidly placed right where your hand needs to be to steady the zoom lens. And I don't even have big hands. No built in flash. Poor battery life. (Really poor compared to my G12.) Lack of manual buttons. Proprietary strap lugs so you can't use a generic strap. Worst of all - the focus position cannot be centre locked, so if you accidentally touch the screen, you end up focusing on something you don't want to. In fact, there doesn't seem to be any lock for the touch screen and I've ended up taking photos when the camera was resting on my chest. Nice idea but very badly executed. Canon should have done better. I finally cracked and decided that Thom Hogan is right - leave the 22mm lens in place and you have a very pocketable camera which can certainly rival the Nikon A, Ricoh GR nd other luxury single fl cameras at a bargain basement price. My initial analysis is that IQ is very good and AF is a little slow. Anyway, my point is don't dismiss this camera out-of-hand ...... actually its pretty good. I bought one yesterday and I absolutely love it for still photography. For moving subjects, it's not the right camera; other than that i am so far very satisfied with this purchase. I also ordered the adapter so that i can attach my glasses to it, hopefully i won't be disappointed. I did experience once in a while the AF issue and it did not really bother me that much (latest fw is 2.02). It seems like the quality of the pictures are as good as a 7D, for sure they are much better than my old T2i. I'm also wondering how this camera could turn out in macro-photography with the 100 mm lens. I bought an EOS-M at the discounted price about 3 weeks ago. Not having a viewfinder has always been a deal breaker for me, because of screen visibility. Not an issue. It's entirely usable with unshaded sunlight falling directly on the screen. I'm amazed at how easy it is to grip and hold steady - with big hands I usually struggle with small cameras. I envisage my DSLRs staying home more often. I think I may finally have found my ideal walk round camera... Absolutely delighted! Just bought it- and I mean JUST from Amazon with the 22- The APS-C sensor got me- I intend using My 50mm EOS Canon with it. As far as the v/f is concerned I will use accessory optical v/fs. I would think that being a Canon the image results should be very good. As to IQ I have heard no complaints. I believe that they brought out a "fix" upgrade for focussing speed. Agree with you totally! It has an amazing IQ, with the slow AF one can learn to live.Just set it on your favorite position and start taking pictures. I just wonder, will there EVER be a review? I have a canon eos m w/ the 22mm lens. Is there another way to zoom besides clicking on the magnifying glass at the bottom right corner? If not, should I return this kit and buy the 18-55mm kit? 22mm lens does not zoom, period. The magnifying glass just magnifies the display, it doesn't zoom the image. If you wanted a lens that zooms, then yes you should trade for the 18-55. Keep in mind the 22mm lens is much more compact and with its f2 aperture will be better in low light, so some of us think this compensates for the lack of zoom. It's funny to look back at the older comments. As I write this, Canon is blowing out the EOS M at $300 with lens. Why? Because they made some horrible "fail"? Because they are embarrassed and humiliated? Ah...no. Because they are a really big camera company and they can afford to unload the first model, if that's what it takes to build a consumer base eager to get more lenses and better bodies. How successful is this strategy? Right now, the slow focusing, viewfinder-less EOS M is the #1 selling camera on Amazon. I bought one to use as a doorstop but it's turning out to be sort of fun with the finger squeezing thing on the LCD. If I keep it, I'll get the wide angle zoom and Canon will make their money back. I got an unbelievable deal on both lenses and the flash. Half the price of Olympus body only but the IQ is better. Touch interface is very intuitive! Despite all the griping, its CHEAP! 300 bucks and it is comparable to the Ricoh GR and the other $800+ APC-S prime lens cameras out there. Very compact, same sensor pretty much, same IQ, and good 2.0 aperature. Sure it might have slower autofocus or whatever, but heck... for 1/3rd the price? I don't mind for slower autofocus, beside it depends on what kind of photography everyone loved? For me, I only like flowers, Long exposure and landscape, I don't like to take people's photo or sport, so AF is not a problem for me. However lack of viewfinder make it harder to take picture under bright sunlight. It's not that cheap in Europe. It's more like €650 for a 22mm f/2 kit ($900). Just got discounted to $300 with 22mm lens in most online stores. I updated my EOS M firmware and am quite pleased with the results. In bright light the autofocus speed has improved when using single point focus and the 22mm f2 lens. Rather zippy, in fact. In poor light there is quite a notable improvement in autofocus speed and almost no "hunting". As I said in an earlier post here, "I do like this camera. Don't write it off." I can't believe there is no full review of the Canon EOS-M or any report of the newly released firmware update 2.0.2 in DPREVIEW. The faster autofocus, a newly released wide angle stabilized zoom combined with a greatly reduced price make this camera an attactive alternative to competitors. Was interested in this camera, as a walkabout camera, as soon as it came out but was put off by the negative reviews on the AF speed and the price. However the latter having dropped by almost 1/2 I bought one online in order to be able to return it if I was not happy with it. That was just over 1 month ago and I have decided to keep it. The AF performance with the kit zoom is much better than what I feared. In the large majority of cases, the AF has locked on by the time I have composed the picture, ~ 1 sec. Only very occasionally the AF is unable to lock. I am a Canon user (5d mkII) and the ability to put on some EF primes (50mm 1.4, 85mm 1.8, etc) is a real bonus. Another great thing is the fact that the flash unit supplied has a transmitter to set off other Speedlites. I like the design and the handling as well as the touchscreen are great. It would be nice to be able to attach a OVF to it, but other than this I highly recommend this camera. Same here. Bought it for 1/2 price a month ago for biking and hiking where I don't want to carry the 5DIII and this little baby turned out to be amazing. I was skeptical because of the negative reviews about the AF but in real use it's really not that bad and the IQ is great. I bought two extra batteries from ebay because the original one goes empty quickly but now the three batteries last for a whole day. I had a NEX-5N before and hated its touchscreen (and the whole menu system) but luckily Canon figured out the way to do it properly and I really like it on the M.
Agree on the OVF but it's a compromise that I'm willing to make because it's a great little camera with super build quality and IQ. The point with the OVF is that as soon as you attach certain prime EF lenses, it would be partially blocked. For using the 22mm pancake, it is possible to attach OVF made for other cameras with fixed 35mm lenses, eg Voigtlander or Leica which attach to the flash hotshoe. Just tested this in the shop and was totally geeked out by the touch screen..."touch and shoot". I thought it was actually relatively fast considering I touched the screen and it focused on the subject there and took the picture all at the same time. Very cool. I just Got this camera yesterday and I feel like all the negative reviews of this camera are ridiculous. Claims of slow start up time and shutter lag are false. Either these are blatant lies or are based on earlier firmware. I would not put this camera in the fastest category but it is fast enough for any normal human. I also have a Sony NEX 7, which is no faster starting up and only marginally faster focusing. The build quality is amazing. It feels like it was made from a solid piece of granite. All in a beautiful simple design with subtle curves that are hard to appreciate from pictures. Hold one in your hand and you begin to appreciate the design. I will admit that the focusing is not the fastest but so what. If you have to have the fastest focusing speed possibly you probably do not care about composition or light and have no business being behind a real camera anyway. I just bought one with the 22 pancake (and another with the 18-55 as a gift). Got a very attractive price for a gray market. My primary body is a 7D (actually a pair of 'em). But I think I'm going to like this little puppy for going walkabout. Yes, I prefer to compose through a viewfinder, and no, this doesn't have one. But the size -- with the 22 f/2, it's lighter and much smaller than my SX-1 (which EVF I really don't care for, anyway) -- is extremely attractive for going places where I don't want to take a heavier load and/or don't want to draw attention to myself. And of course, it can AF during video, which the 7D can't. I've ordered a third party adapter to use my other lenses with, but I suspect a lot of the time I'll just stick with the 22. I look at it as a classic rangefinder with a 35 f/3.2. The AF takes some getting used to, but my sense is that it's not too bad as long as I don't try to go beyond its capabilities. I have to say that it is a bit tiring to read all of the negativity about this camera in these forums. It may not be perfect, but show me a camera that is. I've had mine for over a month now and am very happy with it. It is a great camera to accompany me on my adventures. It is more compact than a DSLR, and also many of the other mirrorless cameras. It fits great into my backpack when I go hiking, climbing or kayaking. I haven't been inconvenienced at all by the supposedly slow autofocus. I've taken great scenery and low light photos with it. I will be heading out this weekend to photograph comet Pan-STARRS. yet handicapped so there isn't a chance of putting even a dent in their mirror business... or even in the mirrorless competition. even the design screams of amateurism - in contrast to a Rebel that at least looks like a serious camera. I purchased one (with fixed 35mm eq) to replace my Nikon D80 / 17-55 2.8; too much to carry about. First got a Fuji XF1, not happy with images, returned it. Then wanted to get an X100. Played with the EOSM and chose it over the X100. I do like the touch screen. Odd, as I am a viewfinder / button / dial freak. It does not draw attention to itself. It just looks like a slightly bulky compact camera. Oh yes, the autofocus is not great, but nowhere near as bad as some would have you believe. Try one out in store for yourself. I do like this camera. Don't write it off. I am putting off further investments in Nikon and M4/3 systems as long as I can in order to wait and see where Canon takes their compact DX platform. I've always preferred Canon for their IQ and ergonomics in compacts. I would love to be able to pare down my closet of multi brand equipment to just Canon for FX and compact DX. Gotta say - just played with my 1st EOS - M and am impressed! I'm off to Warner Studios Harry Potter Tour next week - will take a whole lotta kit.. wish I was taking an ESO-M ! Remote Capture is impossible with it ! That's crazy for such an expensive camera. Tethered shooting is not allowed, and Live View through the computer screen is also not allowed. This appears to be a last minute decision from Canon's marketing team since these functions were listed in the preliminary specification (as of early oct 2012). The EOS M should therefore be rebranded as "Powershot M" instead of "EOS M". Sorry I dropped the "D" !